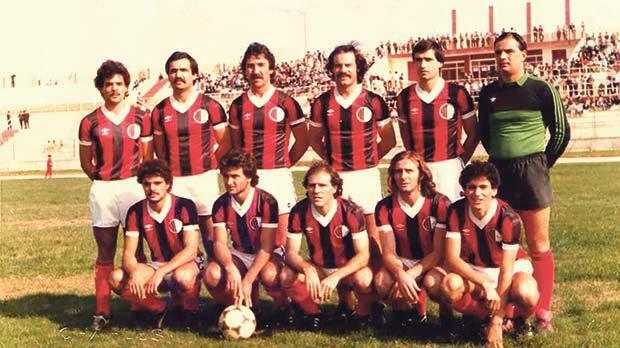 A typical Ħamrun Spartans formation in the 1982-83 football league season. In 1982-83, the Premier League had one of the most dramatic endings in the history of the game. From the very start, Ħamrun Spartans went all-out to win the championship. Throughout the long months of the campaign there was never any doubt of their intentions but it was the way they went about it which left everyone bewildered. During the summer, Ħamrun brought Edwin Farrugia and Raymond Xuereb from Floriana, goalkeeper Joe Brincat from St George’s and Carlo Seychell from Valletta. These players added experience to a young and talented squad. Led by their shrewd president, Victor Tedesco, the Ħamrun committee marshalled all their forces into one bold attempt at the championship crown. Tedesco captured the imagination of the public when he signed two foreign players. The inclusion of Englishmen Peter Hatch and John Linacre not only strengthened an already formidable squad but it also served to unite the whole town behind the team. The authorities, however, refused to issue working permits to Hatch and Linacre and the case took so long to solve that much of the novelty of the idea was lost. This case, however, was important because it injected into the game a new element. Before long, all other clubs followed suit and sparked an influx of foreign talent. The Spartans were in a class of their own that year. They won three points off Sliema Wanderers and Floriana and scored doubles against Żurrieq, Rabat Ajax and Valletta. The only team which they failed to beat were Hibernians. At the start of the season, Hibernians were considered favourites to complete a successive cham-pionship treble. It was, however, a negative season for the champions. In a campaign full of surprises, they not only surrendered their title but up to two minutes from the end of the regular competition they were still in deep relegation trouble. At the end, it was Sliema who got relegated for the first time in their club’s history. By 1983, the Spartans had yet to win the FA Trophy. They were twice finalists before but on both occasions they were beaten by the Wanderers. In 1982-83, the Spartans were determined to break the hoodoo and add the FA Trophy to the league championship to make it an impressive double. They started with a clear 3-0 victory over Gudja United but then they had to overcome the stiff challenges put up by Rabat Ajax and Żurrieq. Valletta qualified for the final after beating Vittoriosa Stars 5-0, Hibernians 3-1 and surprise package St Patrick’s 1-0. The Saints’ progress in the competition was halted in the semi-finals by Valletta, but at least they had the satisfaction of going down fighting. Goalkeeper Eugenio Duca was the main protagonist for the Żabbar club on that occasion. Throughout the game he made numerous saves, some of which bordered on the impossible. He even stopped a penalty. At the end, Nardu Farrugia beat Duca to smash the Saints’ dream of reaching the final for the first time. The final created great interest. Matches between Valletta and Ħamrun are always hot affairs. This time, however, the police took no chances and imposed strict disciplinary measures at the stadium. Although the crowd numbered over 10,000, there were no serious incidents on the day. As for the game itself, it left much to be desired. Leo Refalo opened the score after only five minutes and this conditioned the rest of the game. Valletta were visibly shaken and, although they took the initiative, they could not settle down. It was a game full of nerves and tension. Valletta tried hard to get the goal which would have put them back in the game but as it is nearly always the case, the reverse happened. Late in the game, Raymond Xuereb scored another goal for Ħamrun which killed any hopes that Valletta may still have had of saving the game. At long last, the FA Trophy had found its way to Ħamrun.